Perfect the look of your complexion with benefit Matte Rescue Mattifying Gel Mini; an invisible-finish gel that works to eliminate shine and absorb excess oil. With a lightweight, water-based formula, the product is infused with soft-focus, blurring Diamond Powder to diminish the look of pores whilst creating a natural matt-looking complexion. Although mattifying, the formula is deeply moisturising and leaves skin looking perfected, soft and supple. Can be used in place of your regular moisturiser, or on top of it. Save your morning (and your selfie) from unsightly oil and shine. Apply matte rescue all over your freshly cleansed face to instantly absorb oil. 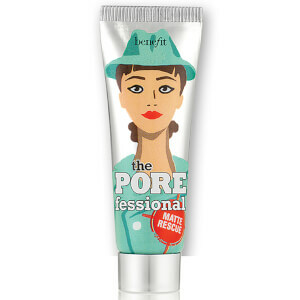 Pat the POREfessional primer on top for smoother-than-smooth skin. Aqua, Glycerin, Propanediol, Silica, Dimethicone, Butylene Glycol, Fomes Officinalis (Mushroom) Extract, Alcohol, Methyl Trimethicone, Pentylene Glycol, Polymethylsilsesquioxane, Peg-60 Hydrogenated Castor Oil, Phenoxyethanol, Dimethicone/Vinyl Dimethicone Crosspolymer, Acrylates/C10-30 Alkyl Acrylate Crosspolymer, Parfum, Sodium Hydroxide, Tetrasodium Edta, Sodium Hyaluronate, Limonene, Peg-40 Hydrogenated Castor Oil, Diamond Powder, Ci 42090 (Blue 1), Ci 19140 (Yellow 5), Bht, Tocopherol. N 09157/E. THE best primer ever! Don’t get me wrong I love the porefessional but this one holds so much better! It’s not at all drying so if you have dry skin it puts the moisture back in while still controlling the oil! I used to have oily skin but since using this it’s completely changed my skin! Will always buy this now!